And of course we all need a little comedy. After all, laughter is one of the best ways to celebrate the new year. 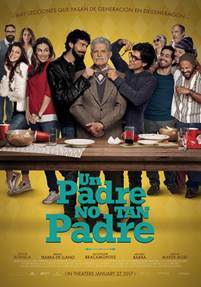 The new comedy starring Jacqueline Bracamontes, Sergio Mayer Mori, and Benny Ibarra "Un Padre No Tan Padre," will have you literally laughing out loud as Don Servando Villegas (Hector Bonilla), an 85-year-old feisty and old-fashioned Mexican patriarch gets kicked out of his retirement home for bad behavior.